You are here: Home » Eating Healthy During the Super Bowl: Mission Impossible? Eating Healthy During the Super Bowl: Mission Impossible? Have you ever thought about the amount of calories one consumes during Super Bowl Festivities? As the Super Bowl has grown into one of the biggest events of the year, so has the menu for the parties. But with all of the fried foods and other unhealthy dishes around, is it even possible to eat healthy and still enjoy yourself? While it is great to pig out and have the usual chips and wings, how about a compromise this year? Try serving some “skinny” along with all that fat! Don’t hang out in the same room where your food is being set up to be served. You’ll be less likely to snack before the guests even arrive. Stay occupied. Focus on the game or your guests, instead of the munchies in front of you. Consume some low calorie beers and hydrate with water, if you don’t want to be out of commission on Monday. Serve more veggies and fruit as fillers rather than potato chips and dip. Be a support group to each other – spread the word to everyone to bring low calorie drinks and dishes. Yes, there will be a lot of food but do you really have to eat all of it? Get your exercise on – when your team scores a touchdown, you are mandated to jump up and down, run around the house and get some jumping jacks in while you are at it! Here are some healthier options for your Super Bowl Snacks. Salsa, Hummus, Bean Dip, or Spinach-Artichoke Dip. As long as it’s made right, you can’t go wrong. Salad on a Stick. A healthy way to snack on the go! Spicy Papaya Guacamole. Pretend you’re on a tropical island while freezing your toes off this winter. 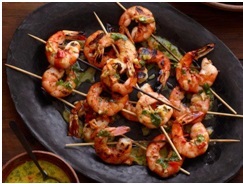 Grilled Shrimp with Orange-Habanero Mojo. Can you say DELICIOUS?! 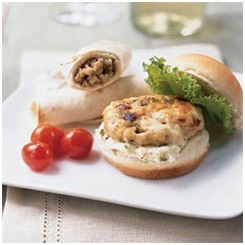 Mini Turkey Burgers with Gorgonzola. Little burger, BIG taste! HAVE A FUN AND SAFE TIME FROM US HERE AT CHEFUNIFORMS.COM! May the best team win! Who are you rooting for? Do you have any other suggestions on staying healthy during the Super Bowl? Leave a comment below and let us know! ← Celebrating a Civil Rights Icon: Dr. Martin Luther King, Jr.